We've partnered with Nick two years in a row for our big agency party at the Cannes advertising festival. He's wonderful to work with, reads the crowd and keeps the flow of the party going. Our guests were totally pleased and we always enjoy working with him. We hired Nick for our event at Cannes Lions and he was fantastic! Great play list, fun personality, prompt and professional. We would hire him again in a second! A huge thank you to Nick for getting everyone on the dancefloor right from the word go and keeping the party going until the end of the night! It was a pleasure to work with Nick and he ensured that all our musical tastes were catered for and made for a very enjoyable end to the Christmas party. All the feedback from the evening has been really positive and we would happily book him again. The venue was equally impressed with his work as they asked for his contact details for their future events. Thank you! I asked Nick to DJ for two company events, in different venues, on the same night. These were taking place during the Cannes Lions festival. Nick took the time to contact and visit the venues so he could familiarise himself, and he kept in contact with the events managers of each venue. On the evening, he was punctual and very professional. He was able to read the audience and pick the perfect music to fit the setting and the crowd. Nick did a great job and we would definitely use him again in the future. Party was a great success and David did exactly as per the brief. The disco end of the party was good fun with the right mix of music for young and younger and we filled in the gaps with tributes to Cilla which David having listened to us probably wished he'd had in his repertoire! He arrived on time, set up without any fuss and played on past midnight. We will no doubt find another excuse for a party and will definitely use you again. It was great to work with you and we loved your music, the full dancefloor being proof of your electrifying tunes! We hope to do it again soon. We would like to thank Nick for helping make our wedding so special! He was more than just a DJ - he managed all of the electrics and lighting, which we weren't expecting. The lighting in the courtyard where we held our reception looked magical and well thought out, just as we imagined it. Moreover, he judged the personal touches perfectly, familiarising himself with North African music and playing it at exactly the right times. He made us feel very relaxed from the first day we met him and we gave him free reign on the music front - it was incredible, we had a whole weekend of fun thanks to him. The proof came when everyone asked for the playlist from Sunday's pool party! Nick and his wife Lisa were incredibly welcoming - they have become friends for life! Nick provided the music at our wedding at Chateau de Berne, Provence in September 2016. Both my wife and I were really happy with how everything worked. From a couple of Skype calls and a number of e-mails, Nick had a great understanding of what we wanted from a music perspective. The way we had arranged the wedding involved using a number of different areas at the venue. This was challenging as we had an outdoor area over water for the ceremony, outdoor area for aperitifs, a conservatory for dinner and a different room for the party afterwards. Nick was set up and sound checked well ahead of our arrival and everything went seamlessly from an acoustic perspective throughout the day. All of our guests had a great day with us and everyone loved the music. Nick was happy to keep playing beyond the official finish and kept tiring people's spirits up. Nick was the consummate professional in terms of set up and logistics. The music was amazing and Nick did everything to ensure everyone was having a great time. Perhaps more importantly Nick is a great guy and absolutely delivered on everything we asked for. I would highly recommend Nick if you are looking for a true professional to take care of your music for your big day! From the moment we met Nick at his place during our wedding planning trip to the South of France we knew straight away that he had to be our man for the job. Nick’s friendly nature put our minds at ease and he was extremely helpful in referring other suppliers in the region and giving us some very honest feedback and advice. Nick also provided lighting for our wedding which looked excellent and really put an extra special touch to what was a fantastic day. Now down to the music…. His playlist was well tailored to what we liked and he was even very happy to take requests from a drunken and no doubt persistent crowd even if the song had been played once before! He knew what to play and at what point and everyone remembered our evening for the singing and dancing at the end of the night. Both Hannah and I cannot recommend Nick enough and would happily speak to any future bride / grooms if they needed any extra insight from our dealings with the ledge that is Mr Boot. When we first talked to Nick on Skype, we just knew that he was the one to rock our party. We started the dancing around midnight and didn’t stop moving our feet until the early morning hours. Nick just got it all right, and the songs he played were a true spellbinder for the whole wedding party. We only stopped for the occasional G&T and the late midnight snack– the music was too good to miss just that one song. Having provided Nick with a playlist of our favourite songs, we still left him enough room to improvise and adapt to the general mood/swing of the evening. We weren’t disappointed. Nobody was! It was the best party ever!!! When we got closer to the official finishing line, we weren’t ready to stop – not just yet. Nick didn’t hesitate to stay a little longer and keep that party going for another hour. He’s just the best…there is nothing more to say. Getting married in France had very obvious upsides – the location, weather, food and wine were all guaranteed to be fantastic. However we wanted our wedding essentially to be a big party and we were struggling to find a local DJ or band that would fit the bill; while the YouTube videos for some of the recommended bands were very amusing they weren’t going to keep the dancefloor full until late. Eventually we were recommended Nick and we pretty much immediately knew we could rely on him to get (and keep) the party going! From our first contact with Nick, to the last tune, the service he delivered was superb. 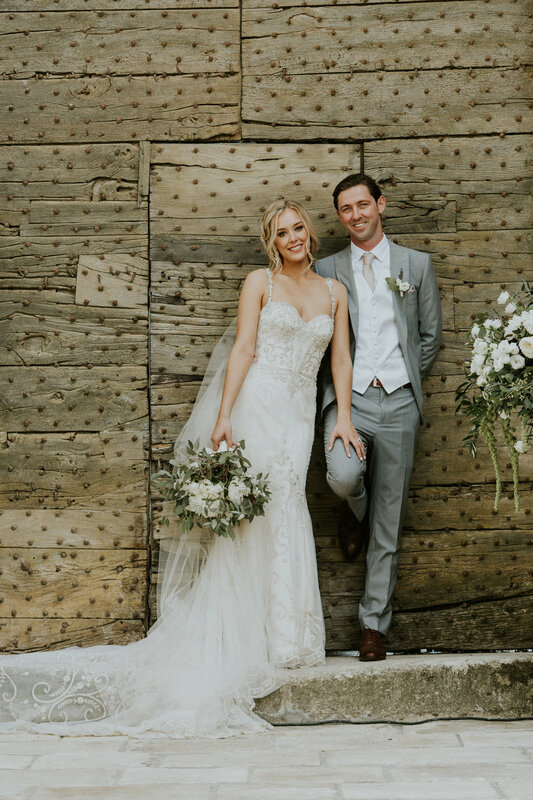 It was one part of our wedding we never worried about – it was a huge help knowing that Nick “got” what we were after and would deliver sets based on our initial discussions without us needing to micro-manage it all. Nick is a really nice guy, easy to work with, responsive and inspires confidence. Above all he delivers a brilliant party - the fact that the dancefloor was still going at 4.30 AM says it all! We would unreservedly recommend Nick. We used Nick for our wedding in beautiful Carcassonne, France. To begin with I was so concerned I wouldn't find a DJ who I could communicate with and feel at ease with in trusting them to basically get the party started, and to keep it going. Then we found Nick! Nick was absolutely awesome to work with and from the very beginning advised us that we could have as much influence on the playlist as we'd like which was very reassuring to hear. After talking with Nick and hearing some of his work I was totally at ease with just sending him a few tracks we liked and for Nick to build a whole playlist round them. We were very happy to leave Nick to it, and he certainly delivered on the day! It was so nice to know that we could relax with the music planning side as Nick had it all in hand. Nick is very professional and clear with regards to costs and expectations and was amazing on the day working directly with the hotel on setting up of all the equipment. Nick is also a lovely guy and we had lots of fun on the night, we even managed to get him round the other side of decks and on the dance floor! He definitely helped make the whole day memorable. I would happily recommend Nick to anyone looking for a DJ and can't thank him enough for making the whole process stress free, easy and fun. Thanks Nick! While contacting Nick for our wedding we were thinking that having an English DJ might bring a good vibe to our wedding party, and it was absolutely right! It was an amazing party with people dancing from 11 to 4am non stop! Everything was so easy to organise with Nick over a few Skype calls and emails to discuss our tastes and requirements. We would like to thank Nick for taking care of all our ceremony music organisation, dealing with all other suppliers and making everything super smooth. We would also like to thank Nick for recommending a great saxophonist he is used to working with (www.sebiojazz.com) as this duo was just on fire! Thanks again. Check out Marion and Franco's beautiful day on Queen For a Day (in French) here. My husband and I both live in London but fell in love with the South of France during our first trip there. As we were going to have guests coming from all over the world and none actually from France, we were quite worried that they won’t enjoy themselves. Luckily, Nick came highly recommended and from the first time we spoke we knew we were in good hands. He took the time to understand our personalities and completely different taste in music and also give us some great advice about coordinating the whole event. The wedding was just perfect! Thanks to Nick there was a flawless transition from the ceremony to the cocktails and culminating into a long night of dancing to amazing music. We couldn’t have asked for anything more :) We highly recommend Nick for his amazing and warm personality, great professionalism and exceptional talent! After randomly bumping into Nick when wedding planning in Provence, we struck very lucky! Music is a big thing for us both and we have quite particular tastes with one of us from France and one from England. We were worried about having a 'typical wedding DJ' who plays their own playlists with 'typical wedding songs'. Living in Dubai also makes it difficult to wedding plan at a distance, but Nick made communication easy and was so open-minded to what we wanted. Music can really effect an atmosphere at a wedding but Nick selected songs that set the scene and the right mood for the right time. As well as playing our own selected songs, Nick added to the playlist according to our taste and got everyone on the dance floor! The biggest thank you is for a song recommended to us for our grand entrance, which was one of the best moments of the day and one we will never forget. Nick DJ'd at our wedding at Chateau d'Arpaillargues near Uzès in September 2016. He was utterly brilliant and could not have gotten the mood and feel of the wedding music any better. He understood what we wanted from the start and made our wedding day perfect. You know it went well when the party played on until 7am and everyone has not stopped talking about it since. Choose another DJ at your peril!! We are both from the US but got married in Provence and our lovely wedding planner recommended we reach out to Nick for our wedding DJ. We are so happy she did because we can't say enough good things about Nick! As a very nice, professional and laid back guy, he was extremely easy to work with from the get go. Even though we were awful at doing our homework (sending him songs that we like), we loved everything he played. We had a very small and intimate wedding and were not sure if a dance party was going to be on the cards for us. Nick proved us wrong and had the party dancing all night long, we had a blast! All of our guests loved him too, he even entertained one of our groomsmen with LCD sound system long after his official time DJing was up. He did a seamless job from the beginning of the planning process, the ceremony and through the end of the night. We could not have had a better DJ than Nick for such a memorable day in our lives, and highly recommend him! My husband and I had our dream wedding in Theoule sur Mer in France 30th April 2016. Since we both are Norwegians and live in Norway, we organized the entire wedding from back home. Music was one of our key factors for a successful day, and having Nick onboard helped us be confident that everything was under control and taken care of at the planning stage. We had several Skype calls, and we always felt that we were prioritized. We had a list of songs we wanted to be played, and at the same time we asked Nick to be inspired by our music and add songs in the same genre, which he did perfectly. Another wish from our side, was that he should play songs upon request from our guests on our wedding party - even though I know for a fact that a few of the requests weren’t really his favourite…. He was always so accommodating and welcoming to all our wishes. We had to rent sound system from him for the party, and he coordinated everything, including setting up sound system for the ceremony too. Nick is a friendly, service-minded music professional that we will highly recommend. He is the kind of guy you wish you had for a friend. Our party wouldn’t have been the same without him. I thought finding a DJ abroad would be the hardest thing ever and even considered just having a band at first, but after just one phone call to Nick who was recommended to me by the owners of the Chateau, I knew he was perfect for the job. With very little direction from us as to what to play he managed to gauge exactly what the different age groups wanted to hear to keep everyone up on the dancefloor until 3am which is extremely difficult when you have a small intimate crowd like ours. As well as the music Nick also provided us with some amazing lighting for our venue and extra furniture for the ballroom which made such a difference on the night. Nothing was ever a problem or too much to ask he was truly an absolute pleasure to work with and I would highly recommend Nick to anyone getting married abroad. In addition, I also met Nick’s wife Lisa on our visit who helped me to source local products for my favours as I didn’t want to have to bring them from England, she did an excellent job working with local suppliers to give my favours that special Provençal twist I was after. Kyp and I got married at Domaine du Mont Leuze in Villefranche-sur-mer on the Cote d'Azur in May 2016 and music was high up there in terms of the most important aspect of the wedding. We live in London are from very mixed backgrounds with Kyp being of Cypriot/British heritage and myself Nigerian/Togolese. We met Nick once before the wedding and discussed our music requirements. Not only were we very pleased that he understood straight away what we were after, but we also both came away thinking he was such a nice guy. He was very professional, personable and easy to get along with. Nick was honest and told us he hadn't covered all of the genre of music we wanted, but would work with us prior to the wedding to create a playlist. We wanted Nigerian, Cypriot, Francophone African, French, R&B, Classic English wedding songs, pop, house... a very eclectic mix and on top of that we wanted a saxophonist playing along. We sent a spreadsheet of the songs, especially the afrobeats we wanted prior to the wedding day and that was it. Nick just worked his magic on the day and we must say given it was his first Afro-English wedding coverage, he did a fantastic job particularly with the mixing. We had music playing during the wedding breakfast and dancing in between courses and he just knew what to play and could read the room perfectly. Our guests loved every minute and we could have gone on till the next day. We highly recommend Nick and can't thank him enough for his services. We wanted to thank you so much for being the DJ at our wedding. It was such a fabulous evening, in big part thanks to you! Many of our guests claimed it was the best wedding music they’ve heard! Woohoo! The music was the life of the party and kept us going from the ceremony until the bitter end. We also have to say, we are really impressed with your professionalism and kindness. We were able to really trust you and rely on you to help us chose the music, which was truly amazing in the midst of all the wedding stress. We wish you all the best and many more events in your future! Thanks a million! Thank you so so much for your lovely email. It made me cry! We truly had the best day of our lives and we’re so incredibly happy that you were a part of it. You were totally awesome… everybody kept saying this DJ is incredible. And you really were. We loved our party! I think we blew the roof off that chateau & sky-rocketed it up to the sky! I think the dance-floor shots are a huge credit to the wicked tunes you just kept on dropping. We’ll be recommending you if we get any more destination weddings, so hopefully we’ll meet again. Thank you so so much. I would recommend Nick and UK DJs Abroad to anyone without hesitation. 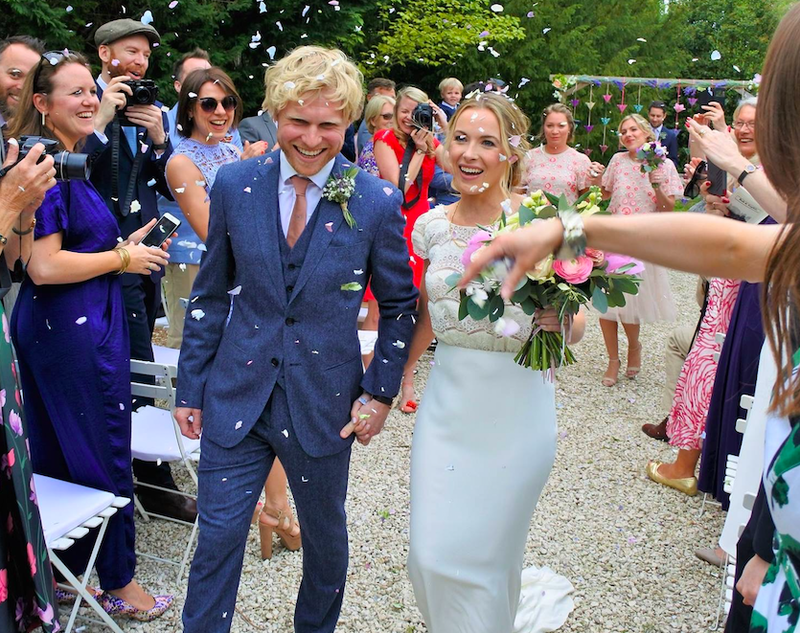 We got married at Blanche Fleur near Avignon in August 2016 and when we booked the venue one of our biggest concerns was making sure we could find a DJ whose quality matched that of the venue, fortunately we managed to find UK DJs Abroad online. Straight away from my first discussion with Nick about music I knew he was going to be the right choice for our day. Once we had booked him he continued to respond promptly to any questions or changes we made as our plans developed and gave us good advice based on his prior experience. He worked closely to the playlist we sent through to him in advance and all his additions to the playlist throughout the night were spot on with the type of music we love. He got all the different ages who attended the wedding up on the dancefloor and really created the great and fun atmosphere we were after right up until 3:30am. The fact we had so many people after the wedding commenting on how good the music was is really testament to the job he did. Thanks again Nick. After months of searching and stressing (and maybe crying a little - but don’t tell anyone) I finally came across UK DJs Abroad. We were planning our wedding in France, and it’s not that I was dead against a French DJ, but I was hoping to find someone English with the same taste in music as us. Plus, any quote I had received had definitely made the tears spring to my eyes again! I was googling UK DJs in France everyday and all I was finding were the same companies I had already contacted, until one day when UK DJs Abroad popped up. Even the name was perfect. Where had it been all this time? Why was I only just seeing it now? I contacted Nick right away and found out he lived in London and just by chance we were due to be in London the following month for wedding dress appointments (we live in Jersey so had booked our trip in advance). We met up with Nick and just as I couldn’t believe my luck coming across his company, he couldn’t believe we had come across it moments after their website had launched (ah, so that’s why I hadn’t seen it before). After our chat in London we realised we had to have Nick DJ at our wedding, he and my (then) Fiancé were both in love with 90s dance. Shortly after we met Nick, he and his lovely family moved to the Cote d’Azur which was perfect as we were getting married in Cannes, couldn’t believe how it was all falling in to place.In the weeks/months leading up to our big day my fiancé and I created vast playlists on Spotify and shared them with Nick, he played all our chosen songs plus padded out with music he chose for us to suit our taste. When it came to the disco part of the evening thankfully he played some golden oldies because we had been too selfish to include any, and it would’ve been a real shame if we’d have missed them out because we wouldn’t have got my 78 year old Grandmother up shimmying on the dance floor!! Nick was with us for 12hrs (poor guy). He played our chosen playlists for the arrival of the wedding guests, the ceremony, the post ceremony drinks and the dinner. Then after dinner he DJ’d for the rest of the evening. He also acted as Master of Ceremonies throughout the day and did a great job of it. Nick’s prices are very competitive, especially for the South of France and if you choose him for your special day, I can guarantee you will not regret it. We both work in the wine industry so decided to get married in the beautiful region of Piedmont in Italy, famous for its wine production. We booked a stunning venue with wonderful food and flew in our favourite wines from around the world but needed a DJ from home to ensure we had a great party in the evening. We flew Nick out from the UK and he did a fantastic job. In fact, the music really made the night! It was all set up outside and it was a really balmy evening so everyone danced the night away. We met with Nick a couple of times in the weeks before we flew out and discussed the kind of music we wanted. On the night he played a mixture of our choices with his own suggestions and from the moment the first person started dancing the party didn’t stop! Nick was also friendly, professional and reliable throughout so I wouldn’t hesitate to recommend him to others getting married abroad. We were married at Chateau St Victor la Coste in Provence and were extremely fortunate to have Nick recommended to us Having been to a wedding near St Remy with a dreadful DJ it's quite a responsibility to find one that works. A bad DJ can ruin the atmosphere ! We were not disappointed. Nick is highly professional , listened to what we wanted , had a huge repertoire of music and enough old versions to keep everyone happy. We had ages 15 to 75 there and everyone was on the dance floor till the small hours. Nick was great fun and kept the evening jumping! He's not only a great DJ but a thoroughly nice guy to deal with and I felt very confident with his level of delivery. I really couldn't recommend more highly! When we were planning our wedding in Monte Carlo the DJ and music was obviously vital as we had both English and French guests attending. We were referred to Nick Boot at UK DJs Abroad and how lucky we were!! From the moment we spoke to Nick he understood what music we were looking for and even asked us for a list of songs we wanted included and he didn't let us down. What a magical evening it was with all guests dancing from the start and continuing to the early hours!! and unfortunately it had to stop. We cannot say enough about the professional and detailed effort given by Nick which formed a big part of the fantastic success of our wedding. We without hesitation fully recommended Nick and UK DJs Abroad. Having Nick play at our wedding was definitely one of the highlights for both us and our guests. We'd hired a band but wanted the last couple of hours to become a real party so didn't hesitate in getting Nick. All we can say is we wish we'd booked him for the whole night. The dance floor was packed with family and friends and even when the venue switched on the lights our guests were chanting for more! We gave Nick a couple of tunes we liked and he was amazing as built the set around those. Couldn't have asked for a better end to our special day! One of the highlights of our wedding in Gordes, Provence was the dancefloor. Our guests had an amazing time and that was mainly down to Nick and his DJ skills! Not only was Nick very professional but he had a great feel for the room, was happy to take requests as well as throwing in his own style and kept the energy flowing throughout the night! We would definitely recommend UK DJs Abroad. Being a couple of many varied international backgrounds (French, American, Singaporean) we thought it would be challenging to get a DJ to speak the same language to us and our guests for our wedding at Chateau de Robernier in Provence. However after having a few conversations with Nick, we left it in his good hands and the wedding party proved that he really understood our unique style and preferences and everyone was grooving. Not only that, we got him to recommend a song for the cake cutting as we had no preference and it was just perfect for the mood (everyone loved it! ), better than we could have chosen for ourselves. Thank you for the memories! The only complaint we have: Nick couldn't stay as long as we wished he did! We’d heard Nick play at a number of boat parties on the Thames and knew we wanted him to play at our wedding. Rob and I met at university and enjoyed going clubbing together for many years so we wanted to recreate a bit of this at the party but without seeing our families cowering in the corners of the room asking “what’s this noise? !” We had an evening consultation with Nick which was great as we went through all the kind of tracks we love and then he made suggestions on how we could create a set which would appeal to all our guests, without compromising on the party style we wanted. We had an absolutely incredible night with everyone up dancing for the whole 4 hours, clapping and whistling! Nick was a total gentleman to deal with and I’d have no problem talking to anyone who was considering Nick for their wedding DJ. He made ours a real party to remember. Booking Nick to play our wedding party was one of the best decisions we made. Having taken the time to understand exactly what we were looking for he made the effort to drop in some pop gems from yesteryear whilst generally whipping the crowd up into a real party atmosphere with a mix of electronica from across the spectrum. He really got the party started and was a top guy to boot (no pun intended).